The ZBOX CI329 Nano from ZOTAC is powered by Intel's Celeron N4110 CPU that integrates a UHD Graphics 600 GPU, which allows it to handle 4K resolutions and H.264/265 decoding. Thanks to the low 6.5 W TDP CPU, the mini PC does not need active cooling and comes with the signature honeycomb passive cooling design. 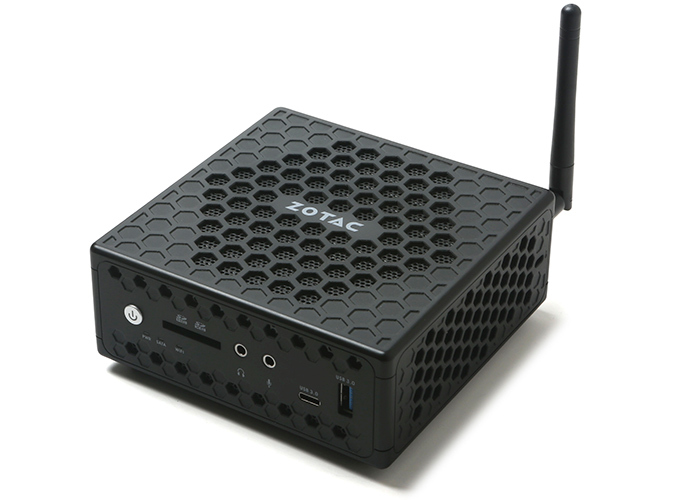 ZOTAC announced that it will update some ZBOX mini PC variants with the new Gemini Lake quad-core CPUs from Intel. These will be primarily designed for office workloads and media streaming. The ZBOX CI329 Nano comes in a 5.31 x 4.99 x 2.24 inches fanless enclosure featuring the signature honeycomb air openings for improved passive cooling. This mini PC will be able to handle 4K resolutions and H.264/265 decoding via the 6.5 W TDP Celeron N4100 SoC that features four cores running at 1.1 GHz (2.4 GHz boost) and also integrates the UHD Graphics 600 GPU with 12 EUs. RAM and storage options include one SO-DIMM that supports up to 8 GB DDR4 and a 2.5-inch SATA bay for an SSD or laptop HDD. As far as connectors are concerned, the ZBOX CI329 features quite a large list: 3.5 mm headphone and mic jacks, 5.1/71 surround sound through HDMI, 1x DisplayPort 1.2, 1x HDMI 2.0a, 1x D-Sub, 3x USB-A 3.0, 1x USB-C 3.0, 1x USB-A 2.0, and an SD card reader. ZOTAC did not release any pricing information, but judging from previous releases, the ZBOX CI329 Nano mini PC should come in 3 variants: a barebones one without RAM and storage, one with 4 GB RAM and 120 GB SSD, and a similar one with Windows 10 on top.